So what’s wrong with Ableton Live’s UI? Not too much actually which made this post pretty easy and hopefully increases the likelihood of its influence. So the problems are waveform and level indicators. Well, the bigger part of the problem, anyway. I realized that this is not really the controller’s fault. 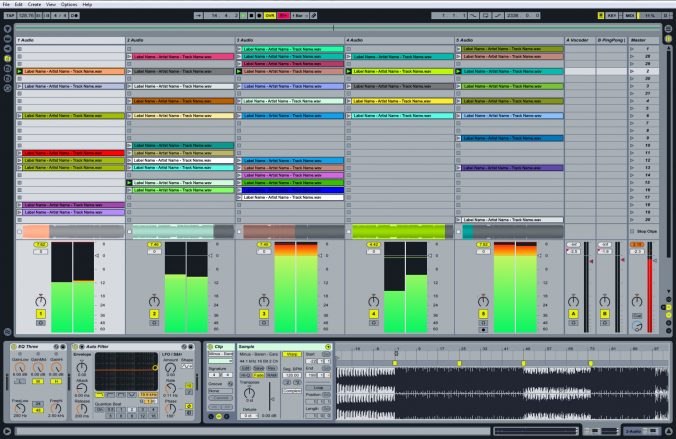 Ableton Live’s interface IS the visual indicator for everything, and with the entire display at its disposal its got plenty of space to work with. So why does it look like a spreadsheet or at best, a calendar? True, the layout of the session view is great for live playing and real-time composing but its really not ideal for DJ sets. There are way too many tiny boxes and there’s barely anything moving. 1. Addition of waveforms for the currently playing track, per channel. This would replace the existing progress-bar style indicator which is tiny and doesn’t show the audio structure of the currently playing clip. Even vinyl records (which had no waveform) did a better job of this since the grooves themselves indicate (upcoming) changes. Btw, I realize that this becomes more complex when multiple clips are playing simultaneously on the same channel, but this prevents independent control over each channel which is why its often avoided in DJ sets. 2. Wider level indicators. Ableton’s interface is very intuitive and slick, but I can’t think of a single reason not to expand the width of the level indicators. (They are currently only 5 pixels wide.) I like to make my channels wider and would expect the indicator to expand with it, but they stay ultra narrow. Why? 3. Better highlight for the currently selected scene. This visual indicator becomes less visible as more content is added to the session, which is the opposite of its utility as its most useful when there are many clips in the session and far less when there are only a few. I often catch myself having to investigate where it is. It should be obvious. 4. Better highlight for the currently selected clip. Here again, quickly locating the currently highlighted clip is difficult. 5. Utilizing empty space. This might be a reach, but when I feel too lazy to hook up my controller or just want to listen to some tracks using Ableton, I often find myself having to switch between the Clip and Track views. Why not have an option to combine them? There’s a always a huge blank space next to the effects on the track view (since I only have the EQ and Filter on each channel.) It would be nice to have the option of displaying the Track settings and waveform next to it. Let’s review what the interface currently looks like. Click on the image for the full-size version (this whole thing is sort of pointless otherwise). And here’s what I’m proposing. Click this one to open it in a new tab and then you can toggle between them to see the difference. So how about it? Anybody from Ableton reading this? No? Santa?